The Alaskan Malamute is not originally man made - it is made by the harsh elements of Alaska. 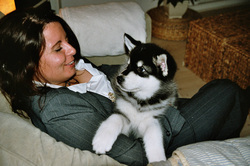 After attending 2 seminars with long time breeder judge Nancy Russel, I´m personally in favor of understanding the arctic herritage of our breed, the Alaskan Malamute - and primary builds my breedings and general understanding of our breed around this subject. Long time before we were smart enough to use this breed to work for us - it was an arctic dog - man decided to make into a sleddog - but it was the arctic living that truely shaped The Alaskan Malamute. Therefor all aspects of this breed is considered survival of the fittest - from the metabolic system, to the exterior to the mindset and behavior. Do not fool your self - this breed is one tough survival maschine with a very high IQ. About 20 mammals live in the Arctic – foxes, Wolwes, reindeers, lemmings, hares, ground squirrels, shrews – as well as a few hundred different insects and numerous birds. So the fauna in the Arctic is more abundant than in the Antarctic, where the largest “terrestrial” creature is an insect; apart from that there are only birds. But Arctic fauna includes no reptiles or amphibians because there is simply not enough sun for them. During the short northern summer, Arctic animals feed and reproduce. The young animals have to grow very fast because only a few weeks after they are born they will have to face the onset of a cold winter or else begin a long migration to warmer climes. In both Siberia and Canada, many animals migrate southwards towards the taiga when winter approaches. Huge herds of caribou (the Canadian name for reindeer), for example, will migrate across waterways and swamps to reach the vast forests of the Deep North. And when animals migrate, their predators (wolves in the case of the caribou) won’t be far behind. When winter comes, warm-blooded animals have to conserve their warmth. Some animals insulate themselves by growing thicker fur or plumage, or by accumulating layers of fat. The smaller mammals (lemmings, shrews, voles) burrow in under the snow to benefit from the warmth still stored in the ground and they feed on plants buried under the snow. Others, like the ground squirrel (or gopher), hibernate. 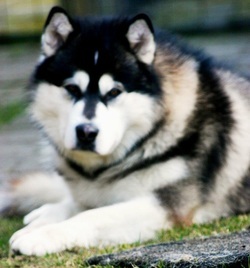 Understanding the clima this breed evolved from gives us a better idea to how the ideel Alaskan Malamute is build and how it acts and what to feed them. The Malamute has a thick, coarse guard coat, never long and soft. The undercoat is dense, from one to two inches in depth, oily and woolly. The coarse guard coat varies in length as does the undercoat. The coat is relatively short to medium along the sides of the body, with the length of the coat increasing around the shoulders and neck, down the back, over the rump, and in the breeching and plume. Malamutes usually have a shorter and less dense coat during the summer months. Survival in arctics can become real dangerous if you loose The double coat is the most obvious survival characteristic of the breed.The thick, coarse guard coat acts as a water repellant covering for the insulating undercoat. Since loss of body heat is so critical to survival, the proper coat is essential.. Dogs with a long soft coat can do well in the cold temperatures,wind and dry snow, but wet and sleet cause ice balls to form on the long hairs. When working the ice pulls the balls out; they will tear the coat right out and without shelter the moisture laden coat will freeze. The dog with a short guard coat can’t tolerate the wind and severe cold as well.They require more food to maintain body weight and when the severe temperatures continue for several weeks, I find fur worn off and sores developing from constantly curling up in the dog houses. The dog with the thick, coarse guard coat and dense oily undercoat seems oblivious to the cold, wind, snow, sleet or rain. He is ready to work or play and sleep out in all kinds of weather. You can almost tell the windchill factor by which dogs are using the dog house and which are sleeping out. Pasterns are short and strong and slightly sloping when viewed from the side. The feet are of the snowshoe type, tight and deep, with well-cushioned pads, giving a firm, compact appearance. The feet are large, toes tight fitting and well arched. There is a protective growth of hair between the toes. The pads are thick and tough; toenails short and strong. En slædehund er kun så god, som dens poter”. Denne talemåde, som findes blandt mushere, skal opdrættere tage alvorlig. Malamutens poter skal være store, og tykke med en god bue. De skal være faste, når den bevæger sig på hårdt underlæg, men de skal kunne sprede sig i blød sne og opføre sig som snesko. Jo større og tykke poter jo bedre. Tæerne skal have normal længde Hvis den bagerste tå er for kort, sådan som man kan se den I “kattepoter” mister poten sine gribe-evner og trædepuderne glider. Det resulterer i at de trættes og slides. The head is broad and deep, not coarse or clumsy, but in proportion to the size of the dog. The expression is soft and indicates an affectionate disposition. The eyes are obliquely placed in the skull. Eyes are brown, almond shaped and of medium size. Dark eyes are preferred. Blue Eyes are a Disqualifying Fault. The skull is broad and moderately rounded between the ears, gradually narrowing and flattening on top as it approaches the eyes, rounding off to cheeks that are moderately flat. There is a slight furrow between the eyes. The topline of the skull and the topline of the muzzle show a slight break downward from a straight line as they join. The muzzle is large and bulky in proportion to the size of the skull, diminishing slightly in width and depth from junction with the skull to the nose. the frost, ice or snow collecting around the eyeby the jelly-like movement of this fat. 2.This fat also works like a sunshade in thatit can droop over the eye with the lid slightly lowered and protect the eye from flying iceparticles etc. Betjenten som er ansvarlig for hundespandene i MT.- Denali i Alaska - fremhæver det vigtige i den mørke næse. Hun siger at lys pigmenterede næser bliver solbrændt i de lange soltimer i løbet af sommeren og at insekts¬værme , som er almindelige i sommermånederne i Alaska , bliver tiltrukket af den lyse pigmentering og hunden har derfor brug for behandling, for at forebygge infektioner. The ears are triangular in shape and slightly rounded at the tips. They are set wide apart on the outside back edges of the skull on line with the upper corner of the eye, giving ears the appearance, when erect, of standing off from the skull. High set ears are a fault. Den korrekte pladsering giver hunden lov til at folde dem sammen mod skallen. Det beskytter mod sne og kulde og beskytter også de indre organer. Det er tilladt at ørerne kan rotere 180 grader sådan at hunden stadig har mulighed for at fange den mindste lyd af knagende is eller en kommando fra team leaderen . Derfor er enhver tendens til at ører, der klasker eller køller sig sammen nedsætter blodcirkulationen og forhøje chancen for for¬frysninger. Ørets brusk skal være tyk og pelsen på ørerne skal være tæt og tykt på begge sider for at minimere varmetab. Næsepartiet er stor og voluminøs i proportion i forhold til kraniet/skallen og som formindskes langsomt i bredde og dybde fra forbindelsen mellem panden /kraniet til snuden. ”. For korte snuder vil fremkalde vejrtrækningsprob¬lemer samt for lav tolerance over for varme.Og da hunden kun har to muligheder for at absorbere sved; tungen og fodens trædepuder, skal Malamuten have en tunge som har en brugbar længde og store po¬ter, da det betyder at de kommer af med varmen, når de arbejder hårdt. The neck is strong and moderately arched. The chest is well developed. Malamutens hals er” stærk og moderat buet”. Hvergang hunden trækker tunge læs strækker halsen sig så langt frem og nedad som der er mulighed for. Dette flytter kraftens tyngde nedad. Jo bedre hunden er til at flytte dette center nedad, samtidig med at give kroppen frem¬drift, jo bedre er den til at trække tunge læs..Malamutens løse hud lap under halsen er et vigtigt karakteristika for overlevelse. Fedtlaget, som ligger inden i det løse skind, isolerer hals og bryst. Den kolde arktiske luft skal opvarmes til op over frysepunktet før det når lungerne. Og når dyret ligger ned, falder folden over brystet og isolerer således området med de vitale indre organer. During the Gold Rush in Alaska in the l890’s there was such a demand for sled dogs that any dog large enough to pull was sent to Alaska. The dogs of the Eskimos were surely mixed with those breeds. Because of this I have made a study of the wild animals of the high Arctic (above the treeline) and those physical characteristics that are common to all of them. The Eskimos of North America and Greenland were the only people that lived in the high Arctic during the winter. The tribes in Europe and Asia were reindeer herders and therefore had to move south to the forest for food for their herds. Therefore the Alaskan Malamute, dog of the Malamute Eskimo in Alaska, was exposed to the most severe Arctic climate. 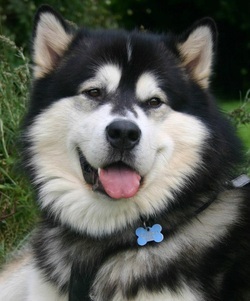 The AKC Alaskan Malamute Standard covers most of those adaptations necessary to survive in that climate such as dark pigment; almond shaped deep set eyes; smaller,thick, well-furred, prick ears; tight lip line and gradual changes in the skull so there are no indentations or depressions to collect snow; roundness of the body and extremities; large feet and a thick weatherproof coat. All of the above you will find on all land animals that live in the high Arctic environment all year. However there is one other adaptation found on all of these animals that is not in the standard of the Alaskan Malamute and that is the dewlap. I have never seen a Malamute without one but they certainly vary in size. The loose skin with its layer of fat in winter is a protection for the trachea. The extremely cold air that is taken in must be warmed to above freezing before it gets to the lungs or the lung tissue will be damaged. The function of the dewlap is described in the book, “The Complete Alaskan Malamute” by Maxwell Riddle and Beth Harris. In Chapter 12 which is written by Virginia Devaney and Beth Harris is the following: “The neck is furnished with a prominent dewlap which is more noticeable in males. This fatty dewlap warms the air descending to the lungs. When a dog pants, air descends directly to the lungs. The dewlap prevents the shock of cold air from being taken directly into the body. The shock of cold air would injure the delicate lung tissues. It was common knowledge of the early mushers in Alaska that if a dog team were run in temperatures below minus 40 degrees that the dogs would have lung damage. During the serum run to Nome in l927 when the teams pressed on though the temperatures reached 60 below zero, several of the dogs died of pneumonia. Very few Malamutes, if any, are working in the temperatures of the high Arctic so the dewlap is not a necessity to their survival today. Since it is not in the standard there will be no reason for the breeders to maintain this characteristic that was so important in their native environment and it will very likely disappear. In fact, some breeders today feel it is not a characteristic of the breed just because it is not in the standard and want to see it eliminated as it will give the appearance of a cleaner, longer neckline. However, Mother Nature does not put dewlaps on all wild animals in the high Arctic unless it is necessary for their survival. And if you look at the same species in warmer climates the dewlap decreases or even goes away. That is enough proof for me that it must be maintained in the Alaskan Malamute if we are to preserve the breeds ability to survive and work in the high Arctic. And it needs to be put in the Standard to assure this will be done. The body is compactly buildt but not short coupled. The back is straight and gently sloping to the hips. The loins are hard and well muscled. A long loin that may weaken the back is a fault. The tail is moderately set and follows the line of the spine at the base. The tail is carried over the back when not working. It is not a snap tail or curled tight against the back, nor is it short furred like a fox brush. The Malamute tail is well furred and has the appearance of a waving plume. En stærk ryg / overlinie (topline) er alt afgørende for at kraften fra bagpartiet kan omsættes til fremadrettet kraft, når hunden trækker. Alle former for svage bagpartier, vil resultere i tab af kraft og effektivitet. Den ideelle overlinie er en kombination af en lang ryg og et kort kryds. En kort ryg er en alvorlig fejl, fordi den mellemste del af kroppen skal være lang nok, for ikke at tillade bagbenene at ramme eller passere forbenene, når hunden bevæger sig i trav. The gait of the Malamute is steady, balanced, and powerful. He is agile for his size and build. When viewed from the side, the hindquarters exhibit strong rear drive that is transmitted through a well-muscled loin to the forequarters. The forequarters receive the drive from the rear with a smooth reaching stride. When viewed from the front or from the rear, the legs move true in line, not too close or too wide. At a fast trot, the feet will converge toward the centerline of the body. A stilted gait, or any gait that is not completely efficient and tireless, is to be penalized.The rear legs are broad and heavily muscled through the thighs; stifles moderately bent; hock joints are moderately bent and well let down. When viewed from the rear, the legs stand and move true in line with the movement of the front legs, not too close or too wide. Dewclaws on the rear legs are undesirable and should be removed shortly after puppies are whelped. Malamuten bør være et “Billede af kraft og balance”. Først og fremmest driver dens kraftfulde bagdel den fremad enten for at søge jorden med ubesværede bevægelser eller transportere tung vægt/ laster med stærke poter. Det ideelle er at hofter og lår skal være bredde og muskuløse. Uden et kraftfuldt bagparti er hunden ikke fuldt ud funktionsdygtig og derfor uden værdi som trækdyr. At være trækdyr er selve kernedefinitionen af en malamute. En hund med et svagt bagparti udfører arbejdet med brystet og vil ad åre udvikle et bredt, stærkt muskuløst bryst og et smalt slapt bagparti. ​Vinkler, som er ude af balance, normalt en stejl front og en overvinklet bagpart, fremkalder mange problemer i bevægeapparatet, fordi hunden kompenserer for dette på mange forskellige måder. Denne kompensation resulterer også i tabt kraft og udholdenhed. Balance refererer dog til mere end vinklingen. Jævnligt ser man at knoglerne er for spinkle i forhold til kroppen og giver en forestilling af en tung / massive krop og tændstik ben. Det kan også ske, at knoglerne er for kraftige og dette resulterer i at hunden virker tung og klodset. . Et hoved, som er for stort eller for lille i forhold til kroppen ødelægger denne balance.. Det er denne balance, som giver Malamuten evnen til jævne, ubesværede bevægelser med fantastisk kraft. Kombineres Malamutens kraft og balance med de karakteristika som gør det muligt at fungere i det barske arktiske klima er billedet af den ideelle Malamute komplet. Malamutens hale er godt pelset og fremtræder som en vejende fjerbusk”. Malamutens hale er mere end kun et smukt tilbehør! For overlevelsen er halen af stor betyd¬ning. Det eneste stykke hud, som ikke er beskyttet hos Malamuten , er snuden. Når hunden sover krøller den sig helt sammen og lægger halen hen over snuden. Halens buskede pels tillader hunde at ånde igennem den. Når sneen falder og kroppen smelter de første lag sne, vil det hurtigt fryse til is .Mere snefald vil nu dække hunden til og den har nu fået sin egen iglo. Derfor vil en kort, knæk¬ket hale elle en hale med lidt pels være en alvorlig fejl og måske endda resultere i hundens død. Når man skal vurdere om halen er korrekt – kan man som udgangspunkt kigge efter at der skal være luft mellem halen og ryggen. Haler der ligger fladt/stramt henover ryggen er ikke en korrekt hale. Eskimokulturen har også formet racens temperament. Eskimoerne var nomader. Det har resulteret i at de territoriale og vagt instinkter er reduceret til at indbefatte rummet omkring hunden og dens ressourcer (mad, plads og ejer) og indbefatter derfor ikke ejerens personlige ejendele. Hjem er, hvor stake outen bliver sat for natten. At dele var en del af eskimoernes liv. Ingen er nogensinde blevet nægtet mad, husly eller endda ens kone. Derfor er Malamuten aldrig blevet brugt som beskyttelse. Malamuten skal være venlig overfor mennesker – i og med aggressive og ustabile hunde vil udgøre en risiko og svækkelse af stammens overlevelse. Der er en udbredt misforståelse omkring, at Alaskan Malamute bør være lige til at sætte ind på et fremmed spand uden problemer. 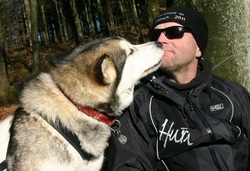 Modsat de eskimoer som havde Sibirian Husky, så havde de eskimoer, som havde Alaskan Malamute sjældent mere end 2 hunde. Men disse to hunde var meget stærke og kunne arbejde længe på lidt føde, dette var påkrævet i den nomade kultur i det klima, hvor disse eskimoer levede. Dette afspejler sig også i Alaskan Malamute idag - deres flok mentalitet indbefatter de hunde, som er født i familien eller som den bor sammen med. Fremmede hunde fra andre flokke vil naturligt blive opfattet som en trussel mod de i forvejen knappe ressourcer, og vil om nødvendigt blive meddelt at de skal forsvinde ud af territoriet. Malamutes are often misunderstood as stubborn or maybee even stupid...nothing could be further from the truth. To survive in the Arctics..you need to be very smart and very persistent. So these two traits combined gives you a dog, that is not only smart enough to only do things if it makes sence - but also will push the boundaries again and again..because that is how you survivie. Dont be fooled to think that pushing the boundaries will happend with marked teeth and growling..no this dog is much much smarter...they work on a much more subtile channel. Because fighting does not increase your chances of survival, unless you are fighting for your life - so they will figure you out and "play you" with that sweet little face they have. The key to understanding this breed is to keep in mind, that whomever has access or controll the access to the resources (food and saving energy) has a better chance of surviving. A full grown Malamute whom "rightly" believes he is the pack leader - because he/she so clearly can se he/she is the smarter one...runs a far more stright pack leadership, that we as human does... On that behalf many malamutes (especially males) ends up in shelters in a very young age. The right owners for is this breed are those who are mature and smart enough...to understand this "game". 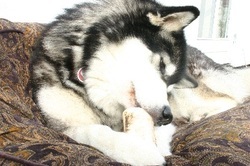 Malamute temperament has been shaped by his environment and his work. His survival instincts are very strong. Don’t expect to teach your dog not to steal food from you or other dogs. His instincts tell him that the dog who stole food even if beaten for it was the one who lived on to perpetuate the breed.The dog who refused to cross unsafe ice, no matter how much he was beaten, is also the one which lived. So independence and stubbornness are two more of their survival characteristics. In the tundra, the difference between the outside air temperature and the body temperature of a mammal can be quite significant – up to 80° in winter. But if the animal’s body temperature falls even just a few degrees, it can die. The only exceptions here are animals that hibernate. Mammals produce their own body heat by metabolism, by “burning” the energy contained in their food. Many people suppose that the animals in the tundra have to search hard to find enough food, but in fact this is not the case. In summer, the tundra vegetation is quite rich and it grows fast thanks to the permanent sunlight. And in winter, all that food is preserved “in the fridge”, where the cold prevents it from decomposing. The animals’ main problem is how to minimise their loss of body heat. - Fur. An animal’s fur often grows thicker in winter and also becomes whiter. This not only reduces heat loss but also provides excellent camouflage. - A layer of fat. This provides heat insulation and also acts as a reserve of energy for mammals in extreme climates. - Body shape. Arctic animals usually have a squat, stocky shape so that they lose proportionately less heat per body mass. Their extremities (ears, tail, nose, paws) are also smaller for less exposure to the cold. - Blood circulation. This is reduced in their extremities and is concentrated in their vital organs, so Arctic animals have cold noses and feet. - Hibernation. Few Arctic animals hibernate because they cannot survive if their body temperature falls below 0°C. Furthermore, in the tundra the ground is frozen and the animals cannot dig burrows to spend the winter in. Only a few animals, such as the dormouse (marmot) and the ground squirrel (gopher) manage to find well-drained (and therefore drier) slopes where the ground will not be so frozen. - A nest. Some animals, such as the lemming, burrow under the snow layer and build a nest using dried plant material to insulate themselves from the damp. Female polar bears make a “nest” in the snow itself and gestate during winter. that is why you see your dog dig hollows in the snow or in the ground - so that they don't lose too much body heat.